Trump: No Plan To Fire Rod Rosenstein [VIDEO] - Joe.My.God. U.S. President Donald Trump said on Monday he does not plan to fire Rod Rosenstein, the Justice Department official in charge of the federal investigation into Russian meddling in the 2016 presidential election. “No I don’t, no,” Trump told reporters when asked if he had plans to fire the No. 2 Justice Department official. 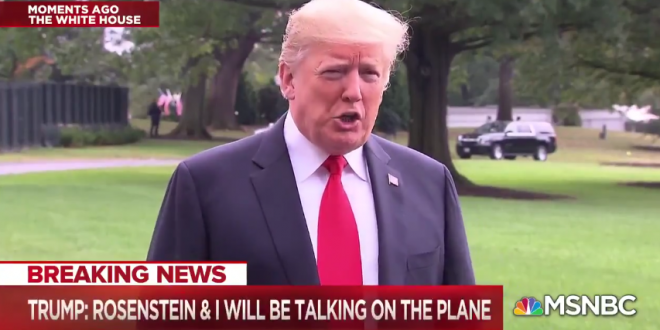 Rosenstein was flying with Trump on Air Force One after widespread speculation just weeks ago that Trump could fire him after a news report that he had questioned Trump’s fitness and wanted to record conversations with him.